When traveling abroad, there is no other experience like cooking and eating a meal with a local. 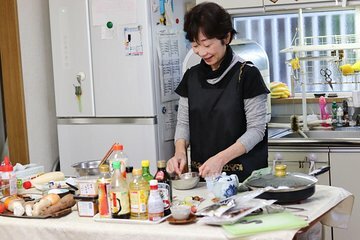 Yoshiko opens her Osaka home to visitors to cook a meal and share conversation. Enjoy learning to make dashi stock and use it to bring out the umami flavor of your dishes. Get a glimpse into the life of an Osaka local, and immerse yourself in Japanese cuisine and culture on this private experience. Meet your host Yoshiko at the North exit of Kawanishiikeda station on the JR Takarazuka line. She will pick you up with her car. Guests can bring their own alcohol to enjoy over the meal.